on one of the oldest documents of Zen Buddhism history. 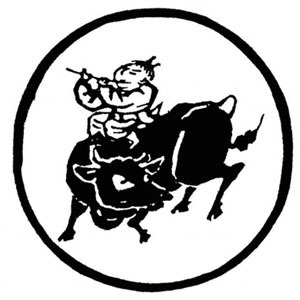 The Ten Bull Pictures or Ten Oxherding Pictures (Japanese: jugyu, Chinese: shíniú) is a series of short poems and accompanying pictures to illustrate the stages of the path towards enlightenment and the perfection of wisdom. Rinzai said that in this five-foot lump of red flesh there is a True Person of No Rank who is always coming and going in and out of the orifices. If you have not seen this True Person yet, see it now. Within this physical body that bleeds when it’s cut, that True Person of No Rank encounters the eyes and becomes seeing; it encounters the ears and becomes hearing; through the hands, it becomes making something; through the feet, it becomes carrying our body. That True Person of No Rank, without any smell or shadow of a small self: if you have not realized that True Person, that true life energy, do it now. or click here for a tablet-formatted PDF. When our vow is deeply realized, we will be able to see that this text, from more than eight hundred years ago, is still shining in its essence within us. • A page full of resources and different versions of the text and pictures, with Indian parallels. With thanks to One Drop Zendo and Sogenji Monastery.